Why Is Apple Cider Vinegar Beneficial For Gout? Gout is a disease that is becoming more and more popular, especially in the countries where citizens have a habit of eating a great number of the calorie-rich foods. It is the redundancy of calories that partially causes gout. The main reason of this disease is an abnormal increase in uric acid level in the blood. When the uric acid level is too high (420 μmol/L for men and 380 μmol/L for women), it will accumulate and precipitate crystals of urate salts at the joints, cartilages, and bones, which causes inflammation, swelling, and extreme pain. More details, the cause of the significant increase in uric acid in the blood is the very high consumption of foods rich in purines such as red meat, viscera, fungi, fish or alcohol drinks. The earliest symptoms of gout are expressed in the hot and painful feelings as well as the swell and tender at the joints. It is true that unless the disease is discovered soon, it may not be cured thoroughly. To accelerate the recovering process of gout, natural remedies should be combined with the treatments. In the post, AllRemedies will suggest you some effective home remedies for the disease with a very familiar ingredient – apple cider vinegar. To learn more about benefits of apple cider vinegar and how to use apple cider vinegar for gout pain relief, let’s keep reading the post. Many people have already known that apple cider vinegar is famous for its anti-inflammatory effects and swelling reduction. Not only that, apple cider vinegar is especially beneficial in reducing stomach acid, gout, and arthritis. 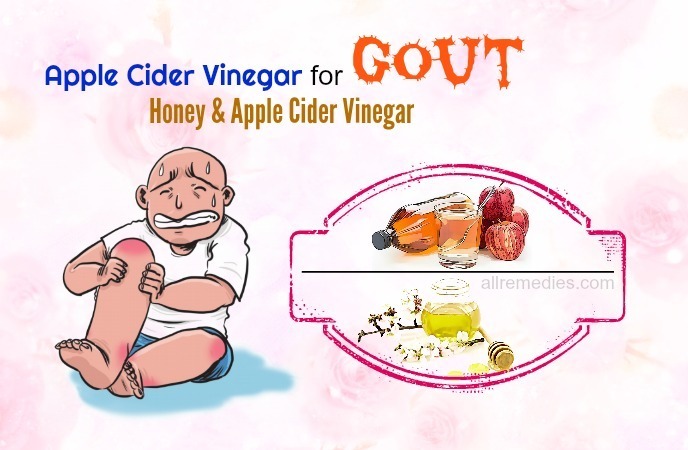 Apple cider vinegar can also treat and prevent gout attacks very well due to a high level of malic acid in it. This acid can neutralize uric acid and prevent & break out the precipitation of crystals. Whereby, gout can be improved clearly with no pain any longer. Moreover, apple cider vinegar also contains an abundant source of vitamin C, which is effective in enhancing resistance, repairing collagen-rich connective tissue around the joints, and minimizing the damage caused by sharp uric acid. 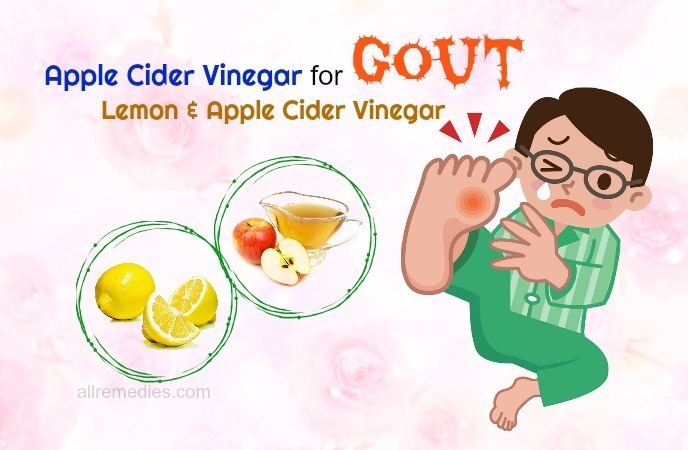 In addition, apple cider vinegar can become alkaline when entering into the body, which helps to eliminate uric acid and dissolve sodium urate crystals in the body; as a result, gout is reduced. It also contains antioxidants that are able to remove harmful external factors causing gouts. Therefore, apple cider vinegar is widely used for treating and preventing gout and bringing a lot of the good results for patients with the disease. Perform the solution 1-2 times per day to relieve gout and pain. After several times of use, you can increase the quantity of apple cider vinegar to 2-3 teaspoons and drink it 2-3 times daily. Honey is widely used in treating diseases related to the inflammation since it has powerful anti-fungal, antibacterial, and virucidal effects . In the treatments of gout, honey is extremely beneficial. So, using pure honey or combining it with other medicinal products can help rapidly reduce the symptoms of gout. Honey contains many nutrients such as vitamins E, A, B1, B3, B6, K, etc. and minerals such as potassium, zinc, iron, calcium, magnesium, especially optimal anti-inflammatory properties; whereby, it is a very good pain relief from gout. Moreover, the purine level contained in honey is very low, so using it will not cause an increase in uric acid in the blood and acute gout pains. Noticeably, it is better to use pure honey otherwise the ability to reduce inflammation will not be optimal. One of the best ways to utilize honey for gout is mixing with apple cider vinegar. This mixture can bring you satisfactory results. Another ingredient that is usually combined with apple cider vinegar for gout pain is cayenne pepper. Cayenne pepper has been known for the usefulness in treating arthritis; so of course, it also has a good effect on gout. An active ingredient called capsaicin or capsicum in cayenne pepper, which makes it hot and spicy, simultaneously relieve pain and inflammation when applied on the affected areas directly. Many types of research show that cherry has wonderful functions in treating gout. In details, cherry contains chemical substances, especially anthocyanin – an antioxidant that helps to reduce uric acid in the blood. Besides, cherry has a high level of flavonoid – a substance that is able to both reduce inflammation and relieve pain effectively. In addition, cherry has a positive effect on the immune system, which declines attacks from gout, simultaneously reduces the volume of uric acid in the blood, as a result, acute gout attacks have no chance to appear. Therefore, for patients with the disease, eating 6-8 cherries daily has the same effect as using medicine or patients can combine cherry juice with apple cider vinegar to create a wonderful mixture to prevent and relieve gout . Baking soda is a type of salt. Whereby, when entering into the body, baking soda increases the pH of the blood and the fluid. As a result, uric acid is dissolved and exerted outside the body through the urinary tract, which helps to avoid the formation of kidney stones and restore the natural balance. In the alkaline environment, it is hard for uric acid to be precipitated and cause acute attacks. However, baking soda is not a medicine to cure gout and depending on each person’s body properties, it brings different effects. One way to make baking soda more effective is combining it with apple cider vinegar. To relieve gout on feet or hands, taking a hot bath is a very simple and useful way. The high temperature from hot water can promote blood circulation and reduce the symptoms of gout. Lemon contains a rich source of Vitamin C, a small amount of citric acid, and a number of complex B vitamins that help treat common diseases including a headache, dizziness, pharyngitis, nosebleeds, inflammation, gums, or even anemia, and constipation. It is the rich in vitamin C contained in lemon that considered as an effective analgesic for acute gout attacks. Moreover, lemon is an acidic fruit, but when assimilated in the body, it will create an alkaline environment and help eliminate uric acid. Thus, people with gout should add lemon to their daily meals because it is able to stimulate the liver activities, effectively preventing the precipitation of uric acid. To create a more effective mixture for gout treatment with lemon, combining it and apple cider vinegar is a smart idea. Ginger is very famous for its anti-inflammatory properties, so it has been used a lot in home remedies for gout . The most popular remedy with ginger for treating gout is combining with honey. Besides, the mixture of ginger and apple cider vinegar has also shown the wonderful effectiveness for the disease in the following simple method. Another method used with apple cider vinegar for gout pain is mixing it with turmeric. Turmeric is well-known for the ability to treat and prevent the diseases related to kidney, heart disease, arthritis, arthralgia, skin, blood circulation thanks to curcumin, a substance contained in it. Curcumin possesses a great number of anti-inflammatory, antioxidant, antiviral, antibiotic properties, whereby; it is super good for reducing the symptoms of gout-like swelling and inflammation. In more details, curcumin is a flavonoid that works in preventing inflammatory reactions in the body very well. The ability to suppress xanthine oxidase by curcumin is quite good, so it can control the main cause of inflammation. On the other hand, the inhibition of xanthine oxidase also works to reduce the production of uric acid in the body as it is involved in the conversion of substances into uric acid. One more ingredient that can be combined with apple cider vinegar for gout is Epsom salt. Epsom salt may be not known by many people but it is true that Epsom salt has a good effect on gout. Epsom salt mainly composes of magnesium and sulfate that can be absorbed through the skin. Sulfate can help to remove toxins in the body and help in the formation of joint proteins. Meanwhile, magnesium can relax the muscle, reduce swelling, and relieve pain. Above all, Epsom salt has the ability to increase the secretion of uric acid through the skin. Therefore, Epsom salt is beneficial for reducing the symptoms of gout. You should follow the recipes exactly, don’t overuse apple cider vinegar since it can cause many serious health problems. Use a small amount of apple cider vinegar when starting using it to test for any reactions. Many people may catch a sore throat, nausea, upset stomach, after applying apple cider vinegar. Drink a lot of water to prevent the precipitation of urate salt crystals in joints. Avoid sweetened drinks like soda, juices, energy drinks, etc. Eat more potassium-rich foods such as potatoes, beans, spinach, etc. Reduce eating the foods containing purine such as meat, fish, etc. These are the most simple and effective remedies with apple cider vinegar for gout pain relief. They may cure the disease thoroughly but can reduce the symptoms of gout considerably if you perform the solutions regularly. If you want to learn more natural ways to treat many other health problems, visit our How To page. Please remember to share your thoughts with us!